Feiwel & Friends, 9781250047182, 176pp. Mike is doing better in school these days. Learning magic helps him to learn other things as well. Sure, he's gotten in trouble in the past, but things are different now. So why does everyone still think he's the same old Mike? If only there was a magic trick to change his reputation... Then, during one of his visits to The White Rabbit Magic Shop, Mike finds something that could be even better than a magic trick-it's possible that Mike could be related to Harry Houdini-the greatest magician ever! 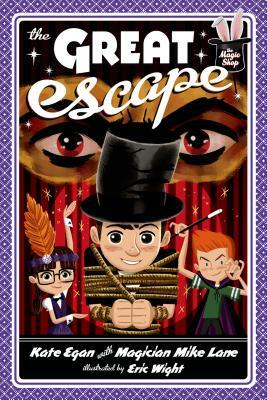 But when Mike lets the news slip, and Jackson Jacobs dares him to prove it, he knows that he's in the type of bind that only magic can help him escape! KATE EGAN is a freelance book editor. She lives in Brunswick, Maine, with her husband and two kids. Kate and Nate Are Running Late! is her first picture book and an accurate depiction of most mornings in her household. Magician Mike Lane has been performing magic professionally for over thirty years. He lives with his wife, Donna, and their two children, Daniel and Lindsay, in Staten Island, New York. Eric Wight is an author, illustrator, and animation director, whose books for children include the Frankie Pickle series. Eric lives in Chalfont, Pennsylvania, with his family.